You searched for which does not fit your . We've redirected you to 103-378, which has the proper fitment. These pipes are chrome with full coverage black heat shields. 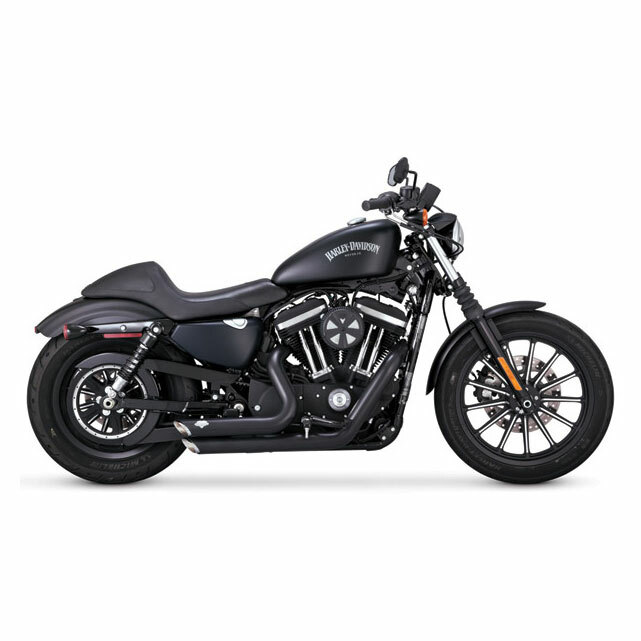 • Vance & Hines Shortshots offer a short, fat, straight pipe look to give your Harley-Davidson Sportster a tough, striking appearance combined with the deep, hearty Vance & Hines sound. These 1-3/4” diameter head pipes are stepped to a 2-1/8” muffler body, and are built with a blue-proof, 220° black heat shield finished off with slash cut chrome end treatments which proudly display the Vance & Hines badge. The 12mm O2 oxygen sensor is located deep in the exhaust stream for more accurate feedback to the ECM. If you want the looks without the deep sound, the baffles can be removed and replaced with optional quiet baffles 450-376. Purchase of the Vance & Hines Fuelpak (or Fuelpak FP3 for 2007 and later models) Fuel Management System is recommended when installing Shortshots on Sportsters with electronic fuel injection. Metal exhaust port gaskets required for installation must be purchased separately 4400281. Vance & Hines is proud to make these pipes in the USA. • These are short, fat, straight pipes give your Sportster a monster sound. • The 1-3/4" diameter head pipes step up to a 2-1/8” muffler body, and feature a black 220° coverage heat shield to prevent bluing. • Chrome slash cut end treatments with a chrome Vance & Hines badge. • The 12mm O2 oxygen sensor is positioned deeper into the exhaust stream, providing improved feedback to the ECM.  Internal baffles can be removed and replaced with quieter baffles to reduce sound 450-376. • Installation of the Vance & Hines Fuelpak (or Fuelpak FP3 for 2007 and later Sportsters) Fuel Management System is recommended when installing Shortshots Staggered Exhaust Pipes on bikes with electronic fuel injectors. • Vance & Hines does not ship metal exhaust port gaskets with the Shortshots Staggered Exhaust Pipes, and must be purchased separately 4400281. • Vance & Hines Shortshots Staggered Black Exhaust Pipes are made in the USA. • Baffles, mounting hardware, and instructions are all included. The pices were easy to install and the directions were pretty clear cut and straight forward. Only issue I have is that the black heat-shields have a few noticeable scuffs on them from the factory. LOVE THESE PIPES. MY BIKE SOUNDS SICK!! HAD STOCK PIPES ON AND PUT THESE ON. WHAT A DIFFERENCE IT MADE. LOVE THEM. HAD A TUNE UP DONE AND MAPPED ALSO. LOOKS GREAT ON MY BIKE ALSO. Quick shipping....arrived on time....everything in perfect condition. I've looked at these pipes over and over for a couple years. But wasn't sure about how they'd look or sound on my 2016 HD Sporty. The uncertainty vs. the price. Now I've got them, got them on, and I'm loving them! Look and sound better than I imagined. Now I'm trying to save for another set to give my Dad on Father's Day. Money well spent. look and sound great!!! There was only one thing i was disappointed with, and that was the Vance and Hines chrome logo fell off :( the exhaust must've vibrated the pop-rivets enough to wear out and eventually fall off when i was riding to work one day... Other than the chrome piece that fell off, I/d highly recommend! Note: Please see U.S. EPA and your respective state and local regulations to confirm noise and emission compliance. • Note: With any new exhaust, we recommend changes to carburetor jetting or use of an aftermarket fuel injection control module. • Flanges and retaining rings are not included with most aftermarket exhaust for 1984-2013 Evolution and Twin Cam models. Re-use your existing hardware, or purchase replacement hardware. Additional oversized shipping charges will be applied for expedited shipments within the contiguous U.S. Shipping charges outside the contiguous U.S. are calculated by weight and dimension during checkout. Due to state regulations we cannot ship this item to the state of California.